Increasingly, divisions in our society seem insurmountable. Racism continues to take its toll. How can we overcome isms and hatred? How can we teach our children to trust and love people whether they are the same or different from themselves? We mourn and grieve each of our losses, but—as the Curtis Mayfield song says—“We must keep on keepin’ on.” Working with school students and teachers is the path I take to keep on building a peaceful, equitable, diverse, and just future. In this endeavor, one of the most powerful tools I use is the full-day social experiment called Mix It Up Day. Teaching Tolerance, an arm of the Southern Poverty Law Center, “is dedicated to reducing prejudice, improving intergroup relations and supporting equitable school experiences for our nation’s children.” Teaching Tolerance initiated Mix It Up at Lunch Day in 2002. The idea was that a simple act of sitting with new people at lunch would help students break social barriers and appreciate and celebrate differences and similarities among the people in their school communities. At The Episcopal Academy, a pre-K-12 independent school outside Philadelphia, Pennsylvania, our Middle School Student Council took the original concept further and deeper, beginning in 2008-09. While many schools participate in mixing it up with special seating and activities to promote positive social interactions during one lunch period, our Mix It Up Day is a full-day social experiment involving 275 students and over 50 faculty and staff. This full day in early spring follows months of lead-up activities including a diversity/inclusion-themed slogan contest, activities interpreting a dramatic production’s themes, advisory surveys and discussions about school climate, and guest speakers on anti-bias, anti-bullying, and diversity-related topics. Our goal throughout is to make our school a safe, welcoming, and inclusive one for each member of our community. Over seven years, student and faculty survey results have helped us evaluate and improve the effectiveness of the day. Overall, students have rated the day as important in teaching about diversity and building and inclusive community. 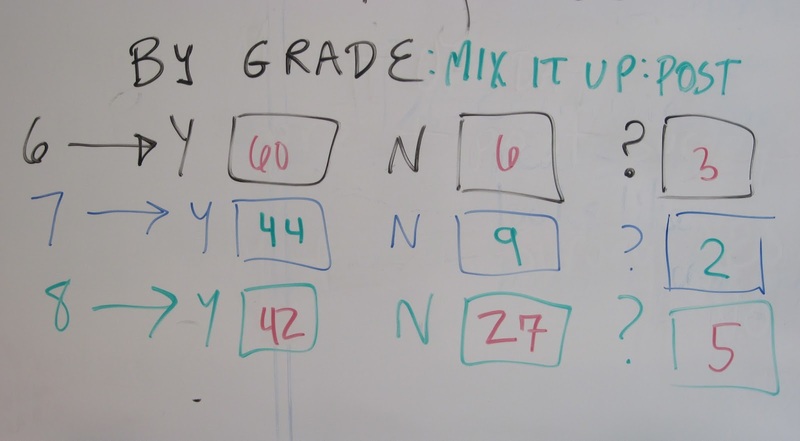 Responding to post-Mix-It-Up-Day surveys, typically, 66% of students state they have learned something about diversity during the day-long Mix It Up Day activities, with 64% agreeing that the day is a “powerful learning experience.” Generally 80-90% think the day is important and should be part of school life annually. Faculty responses have been positive as well, with 89% of faculty respondents agreeing that the day is a meaningful teaching tool and should be continued. Faculty and staff at other schools have asked for advice on how to strengthen, deepen, or change-up their participation in the day. 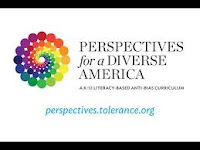 This blog details learning goals, planning, sample activities, and reflections from Episcopal Academy Middle School, recognized by Teaching Tolerance as a three-time Mix It Up Model School. · Identity: Students will understand the multiple facets of their identities, know where those traits come from, and feel comfortable being themselves in a diversity of settings. 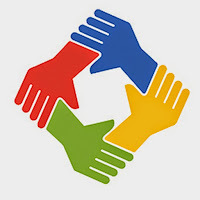 · Diversity: Students will recognize the diversity of people in the world, be able to identify differences and commonalities, express interest in the lived experiences of others and develop genuine connections with others. · Justice: Students will be aware of bias and injustice, both individual and systemic, will understand the short and long-term impact of injustice, and will know about those who have fought for more fairness and justice in our world. · Action: Students will feel confident that they can make a difference in society and will commit to taking action against bias and injustice even when it is not popular or easy. · Identity: Be who you are. · Justice: Recognize and break stereotypes! · Diversity: Express comfort with people who are similar and different. 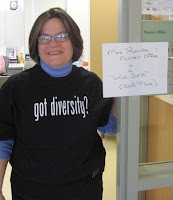 Experiential Learning about Diversity and Inclusion: What Would You Do? Under our guidance and with input from Walidah Justice (Director of Diversity and Inclusion), Steve Morris, (Head of Middle School), Kim Piersal (Director of Experiential Learning), Gina Tomkowich (Middle School Drama Teacher), and many others, Student Council planned a day that started with homeroom T-shirt distribution, included videos and discussions in classes, incorporated simulations of unearned privileges and restrictions, featured a musical presentation, moved to mixed up seating at lunch, and concluded with team-building activities at sports block. Participants (students, faculty, and staff) wore blue, pink, green, or orange T-shirts that determined different privileges and restrictions through the day. Selecting short videos from the John Quiñones ABC-TV series, Student Council asked participants to consider “What Would You Do…. ?” in situations in which people are treated unfairly because of gender, age, economic class, race, religion, ethnic background, sexual identity, or other social identifiers. Beginning each class, a loudspeaker announcement introduced the video and posed discussion questions and restrictions for group or another. Here’s an example. Announcer: “We want to be able to trust our friends to accept us as we are, even if we are different. Sometimes they don’t. In this video, a teenager confides in his teammates who reject him. He feels silenced. In this class BOYS will be silent, in hopes of understanding what being silenced feels like.” The accompanying video was a WWYD episode in which a gay athlete told his friends he was gay. Another class began this way: “Differently abled people often experience discrimination and thoughtlessness. This video shows a person with a disability facing discrimination. Will bystanders be helpful? In this class, ORANGE & PINK may not open or close doors or laptops without assistance, in hopes of understanding one aspect of ability and disability.” The WWYD episode featured a sales person’s discrimination towards a blind customer. Thus, depending on the teachers’ plans, students might experience the unearned privilege of special seating or treats in one class, or the unearned restriction of being denied a chance to speak or use class supplies in another. Hallway signs directed students to use water fountains and stairways based on the color of their T-shirts. All these were purposeful reflections of historical and current events about which students were (or would become) well aware. Mid-morning at an assembly, a group of Middle and Upper School singers and actors presented a stunning performance of “Make them Hear You,” from the musical Ragtime, further emphasizing the one of the days’ themes of standing up against injustice. 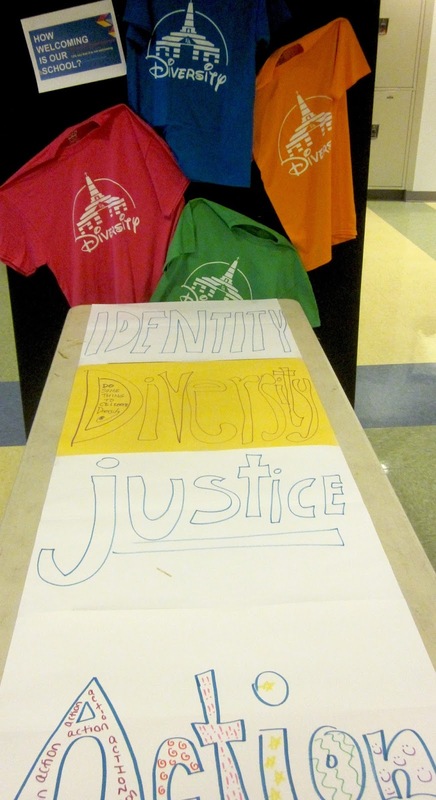 Segregated by T-shirt color, the Middle School community pondered the non-violent path against racial injustice detailed by characters in the play excerpt. 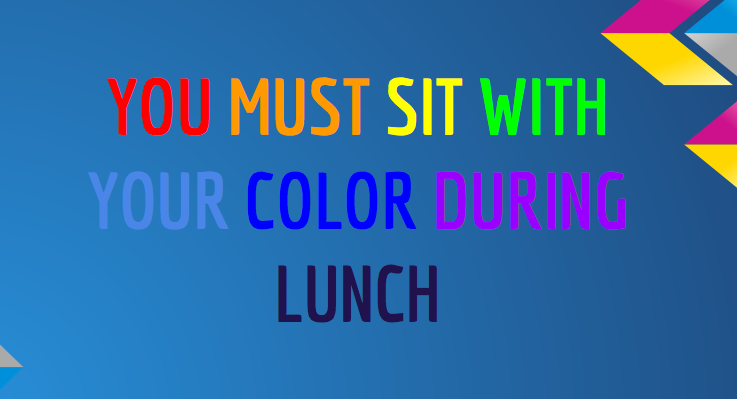 Later, students and faculty again sat by T-shirt color at lunch to “mix up” typical social groups. Thus, sixth, seventh, and eighth graders shared tables with faculty members. Cafeteria staff reminded students of restrictions and privileges in the lunch lines regarding desserts and drinks. During sports practices, coaches engaged in team-building activities to end the day. In 2014, we connected Mix It Up Day class announcements with the drama club’s spring play, I Never Saw Another Butterfly. Set in World War II, the play explores themes of persecution and endurance. Loudspeaker announcements introduced new concepts to each class and connected themes from the play to literature and history students were studying in their classes. Here is an announcement given early in the day: “In 1920, American women finally got the right to vote. Around the world, many girls and women are still deprived of their right to vote, education, and equal wages. 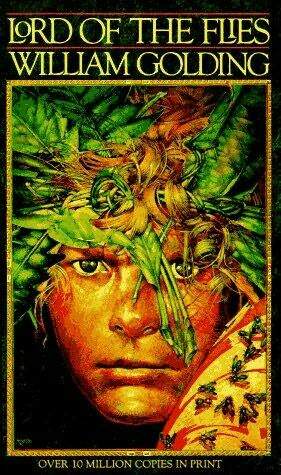 Jack in Lord of the Flies says, ‘It’s time some people knew they’ve got to keep quiet and leave deciding things to the rest of us.’ In this class GREENS will keep quiet and leave the speaking to the rest of the class. GREENS are not allowed to speak. Experience for a class period what this means.” Teachers could then opt to show a short video about the women’s suffrage movement in the United States. 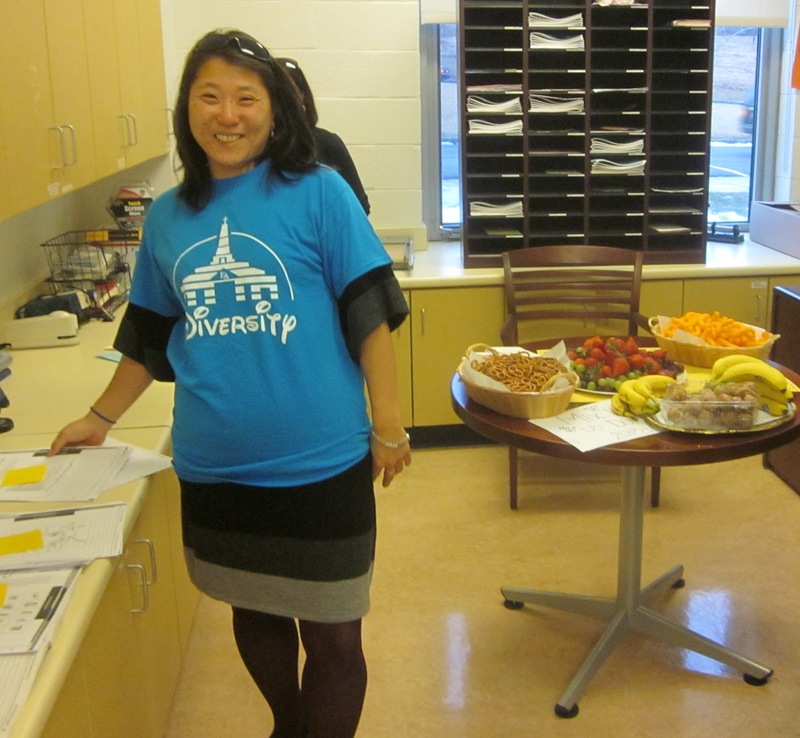 Announcements later in the day encouraged students to overcome differences and build an inclusive community. Here is the announcement from the last class period: “In 1991, Rodney King pleaded for peace in Los Angeles asking, ‘Can’t we all just get along?’ An EA sixth-grade parent, said, ‘It is not necessarily your background that defines you, but it is how you live your life that defines who you really are.’ In this class, you will take lessons you have learned during Mix-It-Up Day to make every person in the room feel safe, secure, and respected. What behavior is important? How is this different from everyday classes? 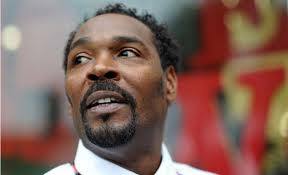 How does this feel?” A video of Rodney King speaking was available for viewing. Announcements have to be composed. 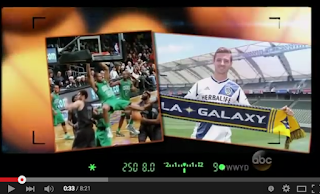 Videos have to be previewed and selected. Surveys have to be evaluated. T-shirts have to be ordered. We need to communicate goals and plans to the faculty and staff. The Student Council meets during a hectic thirty-minute lunch period once every six days. A project of this size is daunting for sixteen middle schoolers and their faculty advisors. How do we pull off this mammoth undertaking? a. Make announcement to Middle School—Do a skit with t-shirts? b. Hold contest/slogan making during Advisory: DATE? c. Judge slogans during meeting: DATE? Invite administrators, diversity coordinators? 3. Set and communicate PURPOSE: Using Teaching Tolerance Anti-Bias Framework, communicate goals via announcements, skits, posters, bulletin boards, etc. 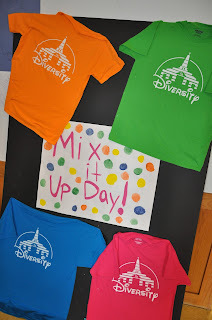 for our Mix-It-Up Day activities, from pre-planning, to the day itself, to post-day activities in EAMS. a. Coordinate with drama/choral teachers. 4. Prepare for the pre- Mix: ADVISORY 1-2 weeks prior to MIUDAY. a. Plan activity and inform advisors. b. Prepare Pre-Mix Survey adapting TT’s survey questions. 5. ANNOUNCEMENTS DURING MIX IT UP DAY-- Prepare the day’s rules, restrictions, privileges, etc. 6. Assembly or ADVISORY DURING MIU DAY? Decide and Plan! 7. End-of-Day: PLAN Sports Block? 8. PRE-MIX ASSEMBLIES, TEACHER MEETINGS, & ADVISORY: How to engage FACULTY AND STUDENTS? Teacher lists all actions taken to bring MIU DAY lessons to life. 1. Create this experience in a safe setting. We acknowledge there is a danger of trivializing important social problems. Teaching Tolerance explains simulations this way: “The basic theory behind simulations is to allow students to assume the roles of other people and act out scenarios in order to gain deeper insight into historical events or phenomena.” We make announcements prior to and during the day to encourage students to understand the importance of engaging in the simulation with an attitude of serious exploration. 2. Don’t group students according to characteristics that represent real-life oppression. Strive for a diverse facilitation team. 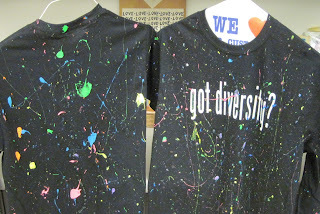 In creating T-shirt groups, we use random designation, thus no group is more heavily weighted with participants from a particular racial, ethnic, economic, gender, or social background. Additionally, our planning team of faculty includes diverse members of administration, faculty, and staff guiding our diverse team of sixteen elected student leaders. 3. Allow teachers and/or students to opt out. Avoid simulations that can trigger emotional traumas. Via meetings, memos, and treats in the faculty room, we ask all faculty members to participate in the simulation during their classes at the level with which they are personally comfortable, although we give numerous trainings and examples to help faculty step out of their comfort zones. We realize some faculty may choose to opt out. Students report via surveys that they are disappointed when faculty opt out, however. · Do a crumpled paper exercise to show how hard it is to repair hurt feelings. · Throw a ball of paper in a recycling can from seats in rows to show how unearned privilege works. Discuss how this related to society at large. 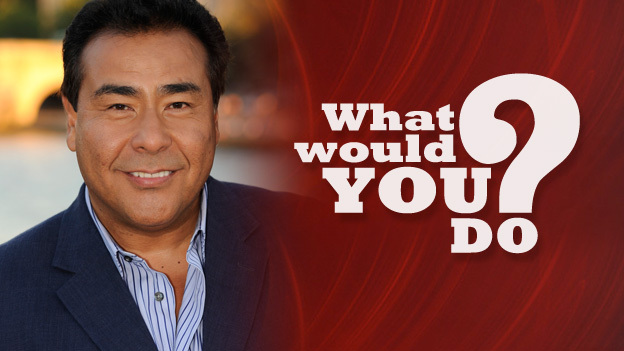 · Read a story about differently abled people, do discussions of WWYD, etc. 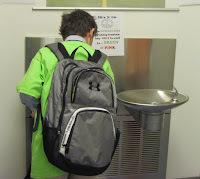 · Students also may opt out in several ways. They may ask the teacher for permission to leave the room to go to the office or nurse, both designated safe spaces (permission granted). They may find another student to be an ally who helps them. They may question the teacher. Some students stage nonviolent or silent protests. o Teachers can use any of these responses as discussion starters to enhance understanding of the purposes of the day and to connect such responses to history, literature, and current events. 4. Participate in the day: --ANNOUNCEMENTS & VIDEOS: During the day there will be announcements over the loudspeaker about one minute into EACH class. · There will be a summary of a scenario and an invitation to think: “What Would You Do?” There will also be a restriction or privilege for various groups in class. We ask adults to help interpret these in light of historical, literary, or current events. 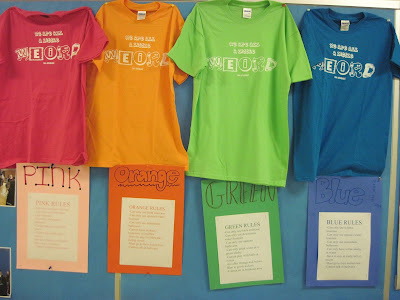 · Example: “All BLUE T-shirt students will now give up their seats and stand at the back of the room.” Or “All Greens will remain silent during class.” Or, all pinks and oranges will try to help each other. 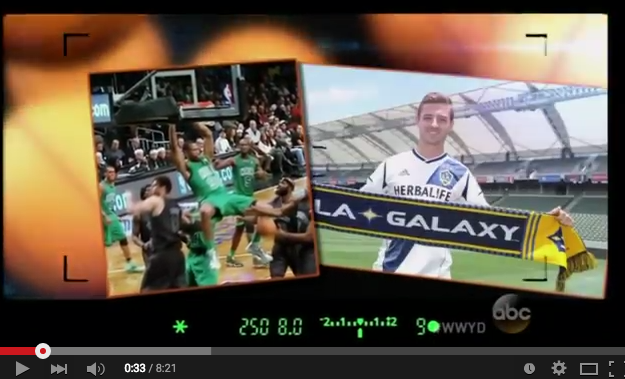 · Play the WWYD video provided for each class block. We recommend teachers show at least the first 3 minutes, although showing the full 7-10 minutes brings the point home and allows students to see many responses to difficult situations. · Invite students to answer three questions below (in writing and/or discussion). · Debrief before dismissing class. 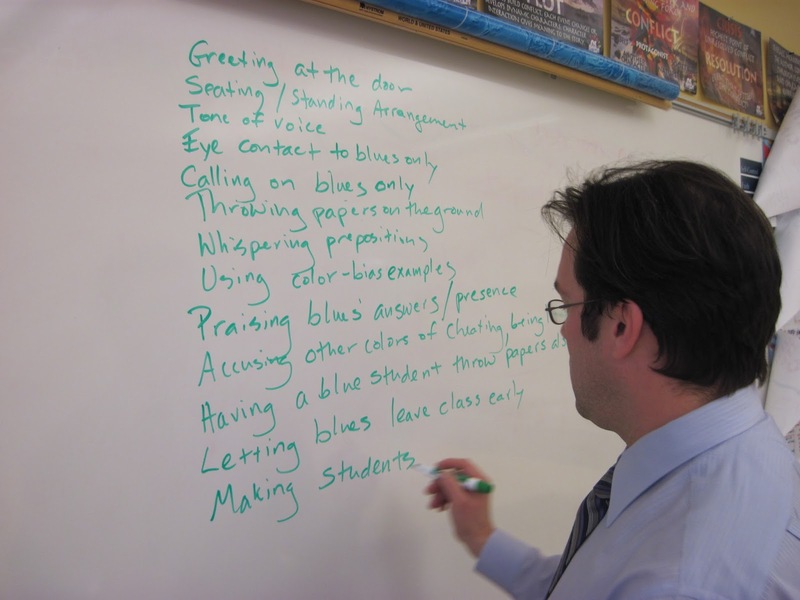 · In addition to these ideas, we welcome teachers to construct their own class lessons, related to academic subjects. · What was the injustice in the situation? · What did the upstander do to help? · What would you have done to make the situation better? Students use "stickies" to share observations about discrimination. 6. Use TIME OUTS & JOURNALS: Many teachers use a system of “time-outs” in the classroom. If a teacher is seriously applying a restriction to one group of students (ex. “Yellow t-shirts cannot use books….”), or conversely if they are privileging a group of students (ex. “Greens can have candy….”), the teacher calls a “time out” from the simulation. The time-out is probably our strongest teaching tool in the simulation. · Gather and engage the students in the class in a discussion of the meaning and implications of unjustified restriction and privilege. Ask, “Do you understand why I am speaking like this? What character in our book spoke this way?” Or… “Would you be able to learn anything if a teacher really treated you this way? Explain.” As students identify their feelings of being restricted and privileged, we tie these experiences into topics in history, literature, current events, and/or school culture. · As soon as each student has had an opportunity to process the simulation, the teacher will ask if the group is ready to go back into it. Students may also use the “time-out” to clarify a point or to help process the simulation. · Another option is to invite students to reflect on their experiences, announcements, videos, etc. in writing in journals or “sticky notes.” These may be shared later or kept by students. 7. We notify families and students in advance. During the weeks prior to the all-day social experiment, our Middle School head, Steve Morris, writes articles in his weekly newsletter, advising families of the upcoming day, its goals, topics to be discussed, and how the day will be different from other days. Assemblies and pre-Mix surveys also help introduce the day to students. Sidewalk chalking is one of the day's activities. 8. Allow time for debriefing; include journal writing; ask open-ended questions: “What happened in today’s simulation?” Connect to real-life experiences and how to apply what’s been learned. Take time-outs during class to allow time for debriefing, as described above. Additionally we ask English and history teachers at all grade levels to assign a short journal-writing assignment after the day. Classes can share the journals the next day. a. Remind students to disengage from the role-play at the activity’s conclusion. Remind students to think about the lessons of the day, whether or not the class has been one of simulation, discussion, or a regular class day. 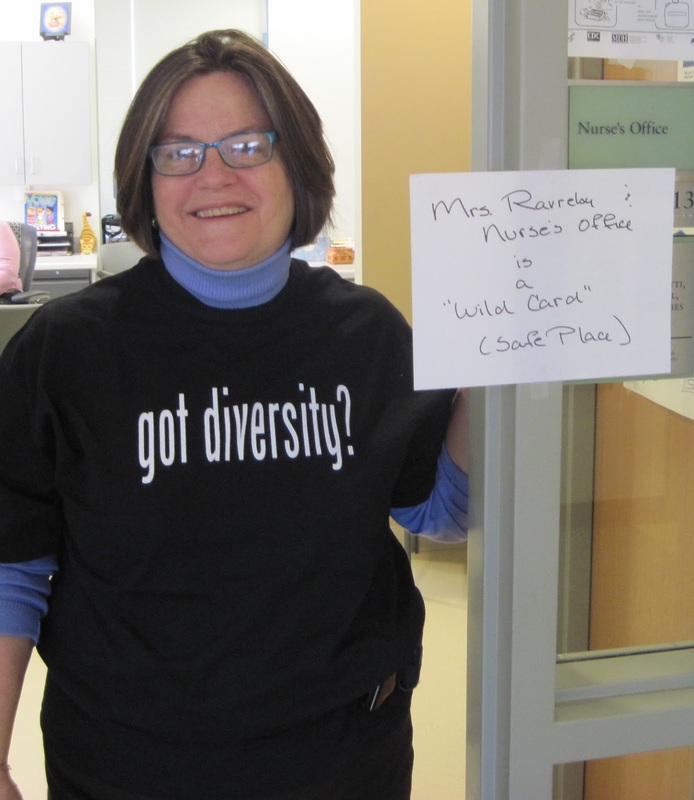 In addition, faculty members are present in the halls to remind students of the spirit of the day. We request that each sports team start practice with a warm-up that celebrates team unity and talents of team members, no matter our T-shirt color. To promote a welcoming community, coaches, please ask your teams to enact the type of sportsmanship, teamwork, and generosity of spirit that will make everyone on the team feel included and treasured. · What did your teachers do to help you understand the lessons of the day? Suggestions? · How did you feel when you experienced restrictions and/or privileges? · Did you connect themes from the videos or announcements to any current events, literature, history, and/or other topics you have discussed in your classes? 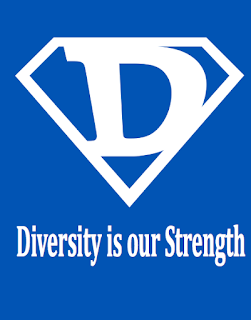 · How can you stop discrimination and bullying of all kinds at our school? Can you stand up for someone if he/she is being treated unfairly? Explain. · Would you want to experience Mix-it-Up Day again? Why or why not? Suggestions? Ideas? · Was MIX IT UP DAY was a powerful learning experience? Agree or disagree. This 2015 surveys were particularly affirming. An overwhelming 90% of student respondents agreed, “I would want to experience this day again.” Sixty-four percent agreed, “Mix It Up Day is a powerful learning experience.” Seventy-five percent agreed that the “videos and activities of the day helped me understand the MIX IT UP DAY themes of Identity, Justice, Diversity, and Action.” We have room to grow in the “action” area, as shown by our question assessing whether any students were inspired to act for social justice and equality. One week after Mix It Up Day, 39% of respondents answered YES to this question: “Have you done anything to ‘Make Them Hear You’ about injustice, disrespect, or bullying since MIX IT UP DAY?” Not a bad start! · This day gives us the opportunity to understand what people have gone through when they are socially neglected or stray away from idea of normal. · It brings people closer together and they take is as a lesson and not a day off. · We fear what we don’t know and knowledge is power, so it is important for kids to learn more about different people so it eliminates prejudice. 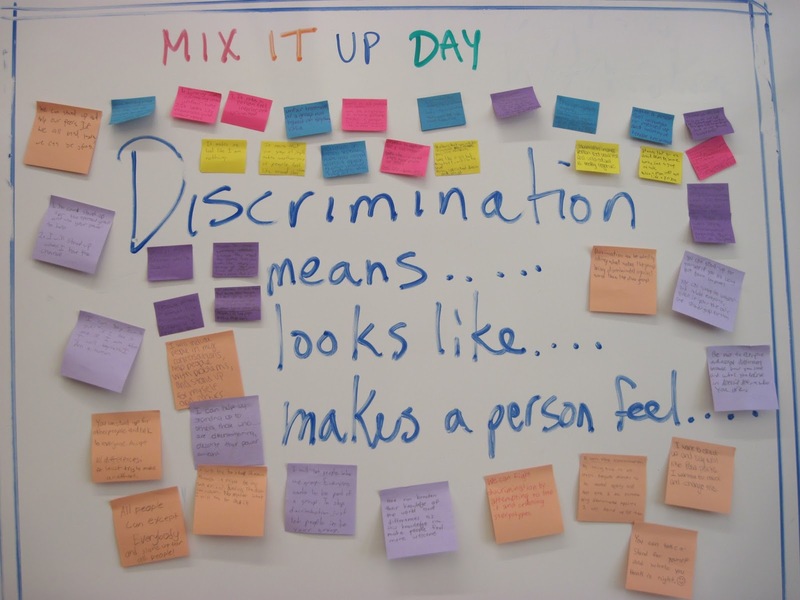 · Mix it up Day is an opportunity for those who aren’t discriminated against to experience what it is like to be judged just because you are different. · This day depicts what happens to real people and all my peers should be able to feel how people have felt all over the world. 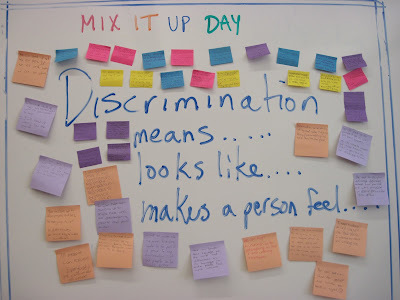 · I love Mix it up Day because not only does it teach us how some people get discriminated against, it shows us how to stand up for those people. · In Mix it Up day we are able to step into someone else’s shoes and experience discrimination from a different perspective. In surveys and journals, students’ narrative comments are particularly effective in conveying the power of the day. Make Mix It Up Day work for your school. Start small, with a Mix It Up Day at lunch. Engage teachers from a variety of disciplines including the arts and physical education to infuse diversity and inclusion themed activities in school plays and athletic activities. Plan assemblies or advisory discussions of your school’s social climate. Involve your cafeteria staff and administrators. Go for a full-day social experiment. Use the resources below to help you make your school into a welcoming and inclusive community of UPSTANDERS for all! These lessons will be long-lasting. We can defeat the isms and keep on building a peaceful, equitable, diverse, and just future. 11. Curtis Mayfield: "Keep on Keepin' On"